William H. Tillinghast and his wife, Phoebe, moved into a newly-completed, Queen Anne style home at No 26 East 64th Street in 1882. Two blocks south, at No. 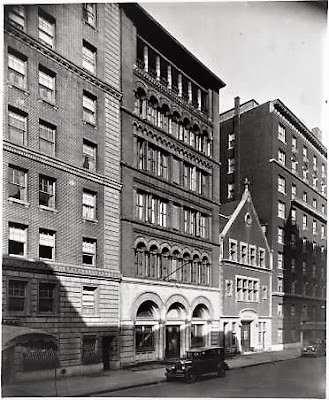 41 East 62nd Street, was their private stable. The Tillinghasts' architecturally up-to-date house signaled changes to come in the blocks east of Central Park. As millionaires moved north of 59th Street, the old post-Civil War brownstones were giving way to upscale residences. Few, however, would compete with the massive brick and stone chateau of Elbridge T. Gerry. The millionaire lawyer was, perhaps, best known for founding of the Society for the Prevention of Cruelty to Children. 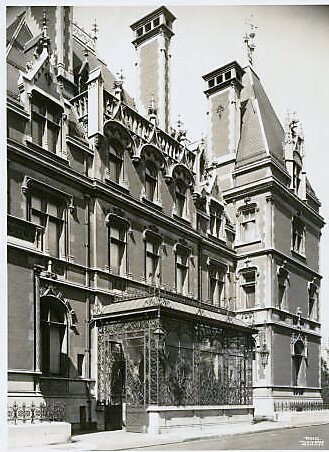 Construction of his immense mansion on the corner of Fifth Avenue and 61st Street commenced in 1892 and would continue for four years. Designed by Richard Morris Hunt, it would be one of the largest and most lavish of Fifth Avenue residences. Nevertheless, Gerry insisted it was "simply a comfortable modern home." As the Gerry mansion took shape in April 1894. 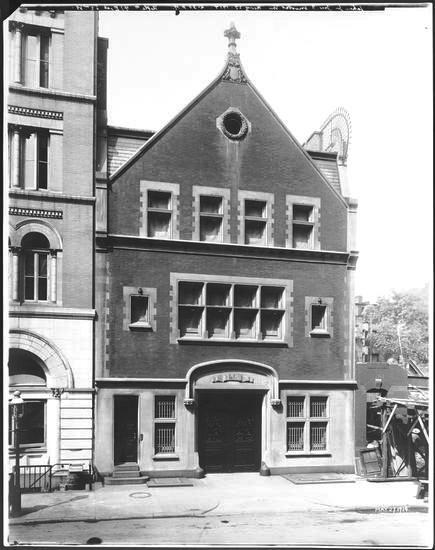 William Tillinghast sold his brownstone-fronted stable to S. Fischer Johnson. The price was listed at "about $19,000." That amount with be equal to about $547,000 today. Johnson soon purchased the 17-foot wide house directly next door at No. 39. But his interest in the properties appear to have been purely in their lucrative possibilities. On April 20, 1896 he bought two other houses along the row, Nos. 35 and 37. On that very day he sold the old Tillinghast stable along with No. 39 to Elbridge T. Gerry. Gerry paid $20,000 for the stable and $25,500 for the house--a total of $1.34 million in today's dollars. Four weeks later architect Alfred Zucker filed plans for a "three story brick stable" with a "slate and tile roof" for Gerry. The $50,000 projected cost, $1.47 million by today's standards, and more than equaled the price of a new home for most well-to-do families. Zucker produced a sophisticated blend of neo-Tudor and Gothic Revival. The centered carriage bay sat below an elliptically-arched Gothic drip molding. The Tudor-inspired openings of the upper floors were framed in stone and the slate-tiled mansard was overwhelmed by a massive gable. Here an oculus sat within a carved stone wreath. Zucker returned to Gothic for the crowning detail--a carved heraldic shield which upheld a stone crocket. The expansive upper floor would have been home to the most important of Gerry's stable staff--his coachmen and their families, for instance. Although, on one hand, being provided with living quarters could be considered a perk of the job; on the other it was a concession to the wealthy employer. Having one's carriage drivers living above the stable meant they were on call 24 hours per day and millionaires like Gerry did not need to worry about getting around whatever the hour. Another down side for the families living here was the noise and the odors wafting upward. The operation of a private stable like this one required a large staff--stable boys who changed the hay and cleaned the stalls, grooms who bathed, fed and otherwise maintained the horses, and workers who cleaned and repaired the many vehicles. The Gerry carriage house would have been a bustling hive of activity. Elbridge and Louisa Gerry remained in their Fifth Avenue mansion for the rest of their lives; Louisa dying first in March 1920. By then horse-drawn vehicles were nearly gone from the streets of New York City. The following year the Gerry stable was converted to a garage, with a "dwelling for one family" on the top floor. It was probably Robert Livingston Gerry, the oldest son, who was responsible for the make-over. His father was 83-years old at the time and most likely little interested in such projects. The top floor apartment became home to Robert's chauffeur, Archibald Day. Robert Gerry was married to Cornelia Averell Harriman, the daughter of railroad tycoon E. H. Harriman. On Tuesday night, January 29, 1924 Cornelia and their nine-year old son were in the family's limousine as Day drove them through the rural roads near Beacon, New York. Further up the road 22-year old Gaeto Denze's automobile had broken down in the roadway. He and another man were attempting to fix it as the Gerry car approached from behind. Day was unable to pass on the left because of an approaching truck. Rather than stop and wait, he passed on the right. Denze, perhaps trying to get out of the way of the truck, suddenly moved directly into the path of the Gerry limo and was struck. Cornelia Gerry jumped from the car and helped to give first aid to the injured man. She had Day put him into the limousine and take him to Highland Hospital. His injuries, however, were severe. He died of a fractured skull the following day. Archibald Day was charged with homicide and paroled to Cornelia's custody. She appeared as a witness in his defense on January 31. She told the Coroner's Court that Day did not see Denza dart from behind the stalled car until it was too late. "It was dark and we did not see any light," she said. In 1944 the Gerry family ceased using No. 41 as its garage and leased it the Central Synagogue Congregation for use as its Community House. Exactly 10 years later the Gerry family commissioned J. B. Snook Sons to design a replacement. While the Landmarks Preservation Commission calls the project a remodeling; the gut renovation apparently left nothing of the original structure but party walls and foundation. So sweeping was the project that the Department of Buildings deemed it a "new building." Whichever, the architectural firm replaced the handsome carriage house with an extremely handsome neo-Federal residence. It was briefly home to Robert L. Gerry's son, Elbridge T. Gerry, before being converted to offices in 1948. Today is is home to the Gerry Foundation.